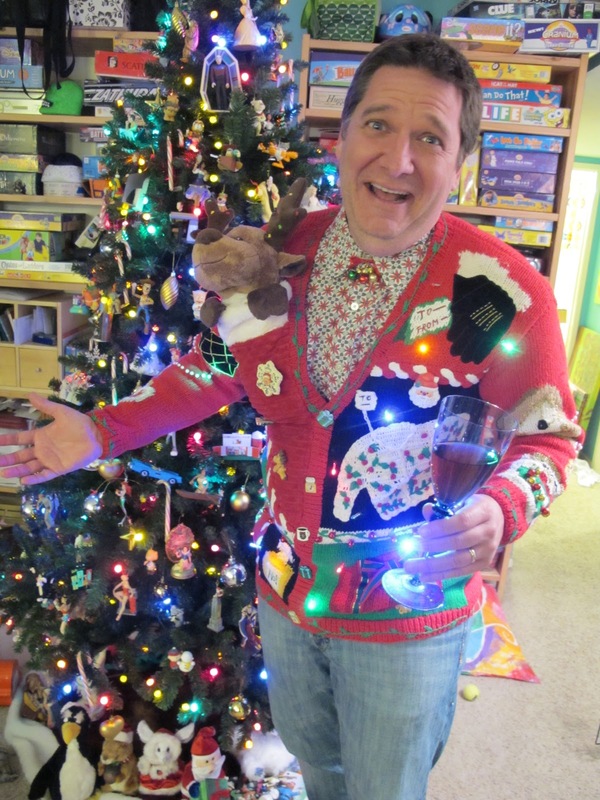 This year my husband's office is having a contest for the ugliest holiday sweater... This contest was made for me! 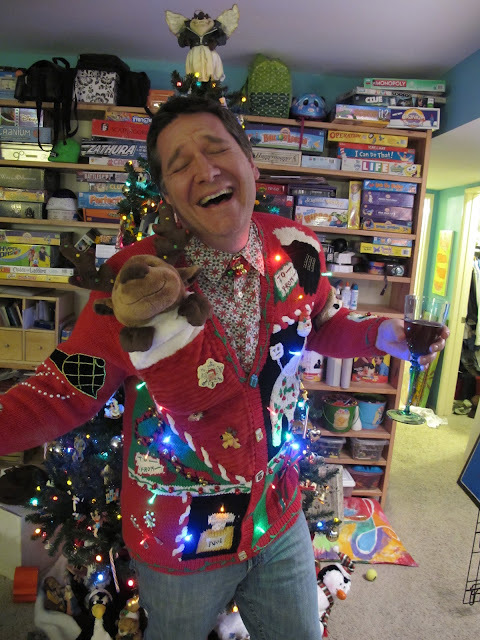 I decided that the ultimate ugly sweater had to have a few basic components: sound, lights, motion, and bling. I immediately started searching eBay for something ugly, but not more than that, I wanted something truly unique. What I found far exceeded even my expectations! No kitten sweater or country chic could beat this one! The theme for the sweater seemed to be "gifts" as it had many different types of holiday gifts knit onto it. There was a clock, gloves, a purse, a mug, and even a bottle of faux Chanel No. 1 perfume. It was beyond good, but I knew I could make it better. 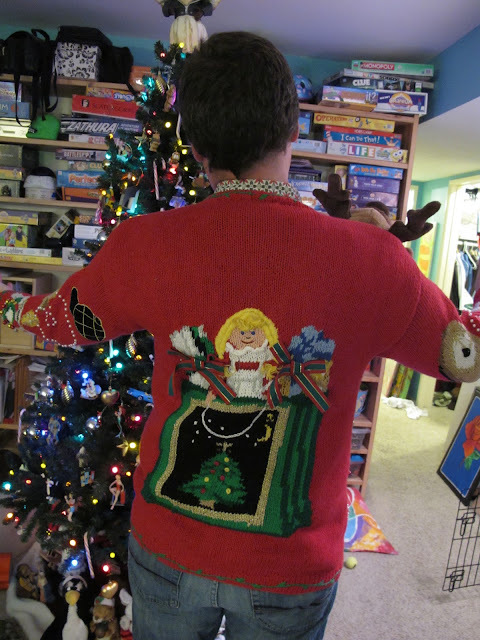 The best part was that the christmas sweater actually came with another tiny christmas sweater knit onto the front of it. Which of course led us to label it the "meta sweater". To add the sound, I hand stitched a stocking with an animated reindeer onto one shoulder. The bonus being that the reindeer also danced while it played music! I added lights powered by a battery pack, and then hot glued rhinestones and bells all over it. ** update 1: won the office party contest! $100 gift card for Italian food. Yum. ** update 2: won a gift basket from WaterBrook Multnomah Publishing Group! Delish. 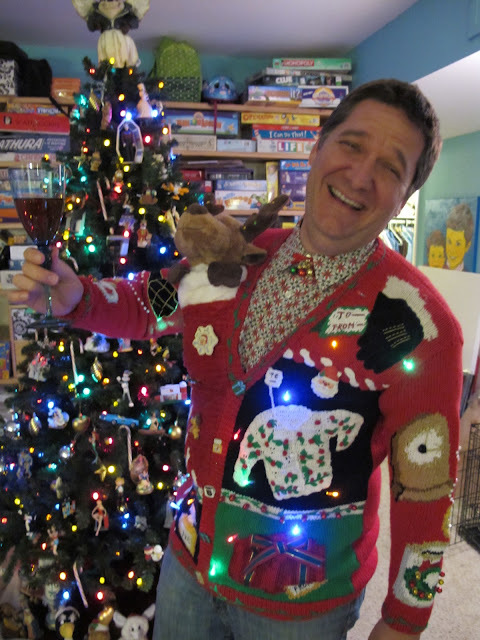 ** update 3: won the San Francisco Chronicle Ugly Holiday Sweater Jubilee. Won two video games, some nice smelling soaps, and tickets to Shrek: The Musical. Plus, a really hilarious write up. THIS SWEATER IS NOW OFFICIALLY WORTH IT'S WEIGHT IN TINSEL! I cannot find an e-mail address to contact you. I think the ugly sweater pictures here are great and would like to use them with your permission. What is the best way to contact you? Chet! You can contact me at edenfolwell@yahoo.com. Thanks!